Sarah Ferber works for Food First NL. 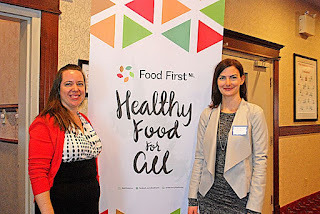 Food First NL is a provincial non-profit working to promote comprehensive, community-based solutions to ensure access to adequate and healthy food for all people in Newfoundland and Labrador. Since 2011, Food First NL has been partnering with seniors' groups across the province to preserve, share and celebrate traditional foodways. Food security is a complex issue in the province, and one of our greatest assets for addressing it is the traditional food skills and knowledge that older generations have to pass on. At the forum, Food First NL will be showing one of their videos called All Around the Table. They will also provide morning refreshments of freshly baked bread and homemade jam. If you would like to know about Sarah's work, you can listen to our Living Heritage podcast episode with her by clicking here.